John Lloyd Stephens and his traveling companion Frederick Catherwood are probably the most famous couple of Mayan explorers. Their popularity is linked to their best-selling book Incidents of Travel in Central America, Chiapas and Yucatán, first published in 1841. Incidents of Travel is a series of anecdotal tales about their travel in Mexico, Guatemala, and Honduras visiting the ruins of many ancient Maya sites. The combination of vivid descriptions by Stephens and the “romanticized” drawings of Catherwood made the ancient Maya known to a wide audience. John Lloyd Stephens was an American writer, diplomat, and explorer. Trained in law, in 1834 he went to Europe and visited Egypt and the Near East. At his return, he wrote a series of books about his travels in the Levant. In 1836 Stephens was in London and here he met his future traveling companion Frederick Catherwood, an English artist and architect. Together they planned to travel in Central America and visit the ancient ruins of this region. Stephens was an expert entrepreneur, not a risky adventurer, and he carefully planned the trip following the then-available reports of ruined cities of Mesoamerica written by Alexander von Humbolt, by the Spanish officer Juan Galindo about the cities of Copan and Palenque, and by Captain Antonio del Rio’s report published in London in 1822 with the illustrations by Frederick Waldeck. In 1839 Stephens was appointed by the U.S. president, Martin Van Buren, as ambassador to Central America. He and Catherwood reached Belize (then British Honduras) in October of the same year and for almost a year they traveled across the country, alternating the diplomatic mission of Stephens with their exploring interest. Once landed in British Honduras, they visited Copán and spent there few weeks mapping the site, and making drawings. There is a long-standing myth that the ruins of Copán were purchased by the two travelers for 50 dollars. However, they actually only bought the right to draw and map its buildings and carved stones. Catherwood's illustrations of Copan’s site core and carved stones are impressive, even if “embellished” by a romantic taste. These drawings were made with the aid of a camera lucida, an instrument that reproduced the image of the object on a sheet of paper so that an outline could then be traced. Stephens and Catherwood moved then to Mexico, anxious to reach Palenque. While in Guatemala they visited the site of Quiriguá, and before wending their way towards Palenque, they passed by Toniná in the Chiapas highlands. They arrived at Palenque in May of 1840. At Palenque the two explorers stayed for almost a month, choosing the Palace as their camp base. They measured, mapped and drew many buildings of the ancient city; one especially accurate drawing was their recording of the Temple of the Inscriptions and the Cross Group. While there, Catherwood contracted malaria and in June they left for the Yucatan peninsula. While in New York, Stephens made the acquaintance of a rich Mexican landowner, Simon Peon, who had extensive holdings in Yucatan. Among these was the Hacienda Uxmal, a huge farm, on whose lands laid the ruins of the Maya city of Uxmal. The first day, Stephens went to visit the ruins by himself, because Catherwood was still sick, but the following days the artist accompanied the explorer and made some wonderful illustrations of the site buildings and of its elegant Puuc architecture, especially the House of the Nuns, (also called the Nunnery Quadrangle), the House of the Dwarf (or Pyramid of the Magician), and the House of the Governor. Because of Catherwood’s health problems, the team decided to return from Central America and arrived in New York on July 31st, 1840, almost ten months after their departure. At home, they had been preceded by their popularity, since most of Stephens' travel notes and letters had been published in a magazine. Stephens had also tried to purchase the monuments of many Maya sites with the dream of having them dismantled and shipped to New York where he was planning on opening a Museum of Central America. 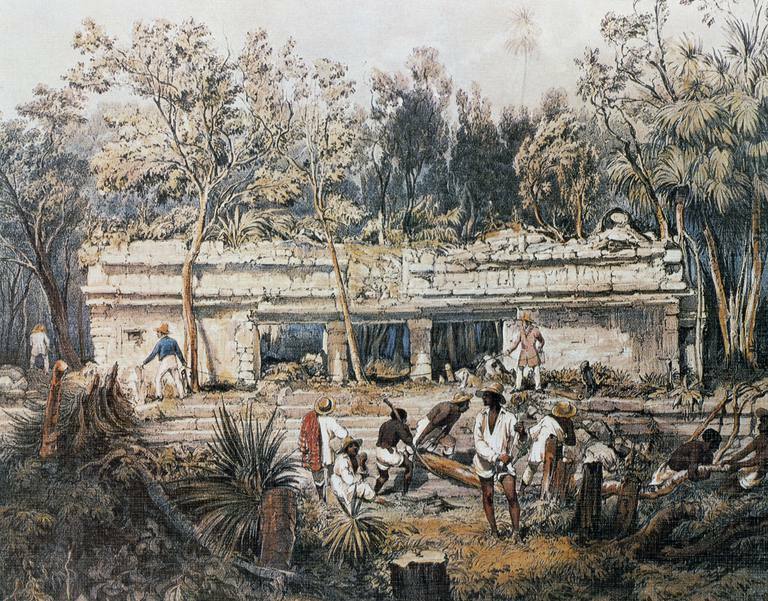 In 1841, they organized a second expedition to Yucatan, which took place between 1841 and 1842. This last expedition led to the publication of a further book in 1843, Incidents of Travel in Yucatan. They are reported to have visited a total of more than 40 Maya ruins. Stephens died of Malaria in 1852, while he was working on the Panama railroad, whereas Catherwood died in 1855 ​when the steamship he was riding in sank. Stephens and Catherwood introduced the ancient Maya to the Western popular imagination, as other explorers and archaeologists had done for the Greeks, Romans and ancient Egypt. Their books and illustrations provide accurate depictions of many Maya sites and a lot of information about the contemporary situation in Central America. They were also among the first to discredit the idea that these ancient cities were built by the Egyptians, the people of Atlantis or the lost Tribe of Israel. However, they didn’t believe that the ancestors of the native Mayans could have built these cities, but that they must have been built by some ancient population now disappeared. Stephens, John Lloyd, and Frederick Catherwood, 1854, Incidents of Travel in Central America, Chiapas and Yucatan, Arthur Hall, Virtue and Co., London (digitized by Google). Should We Call it the Mayan Civilization or Maya Civilization?